Desserts for dinner? Yes, I did that (again). And it was delicious. Recently, I was lucky enough to be invited to a very special dessert date at the recently opened LA outpost of NY’s popular Fig & Olive. My date for the evening was the lovely Lynn of The Actor’s Diet. 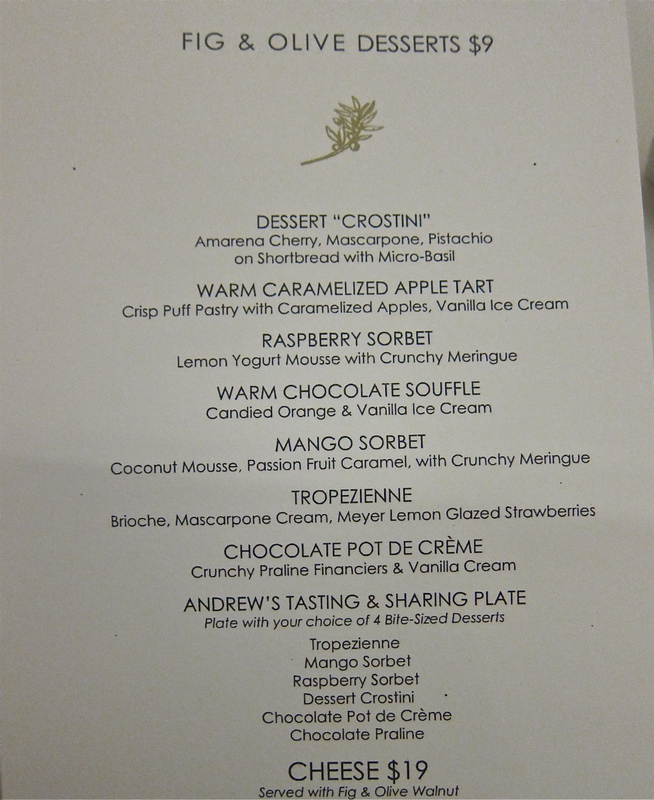 We started off our dessert dinner with the “Tasting and Sharing Plate” ($9). Four mini versions of dishes from the dessert menu were presented to us: mango sorbet, raspberry sorbet, chocolate pot de crème and “dessert” crostini. The sorbets were not simply scooped and served. Instead they were topped with creamy infused mousse and a crunchy meringue. The mango was tangy yet sweet, accompanied by coconut mousse, which was a fantastic compliment. The raspberry sorbet was sweet and smooth with lemon yogurt mousse. The crunchy meringue on both sorbets provided a lovely textural contrast. The chocolate pot de crème was solid but nothing impressive. The dessert crostini on the other hand was phenomenal – delicate and crumbly short bread was topped with a silky mascarpone cheese and incandescent amarena cherries. Such a seemingly simple dish was profoundly wonderful. All of the components folded together into one sweet confluence of deliciousness. Next we enjoyed a tropezienne ($9), a brioche bun filled with mascarpone cream and served with Meyer lemon-glazed strawberries. 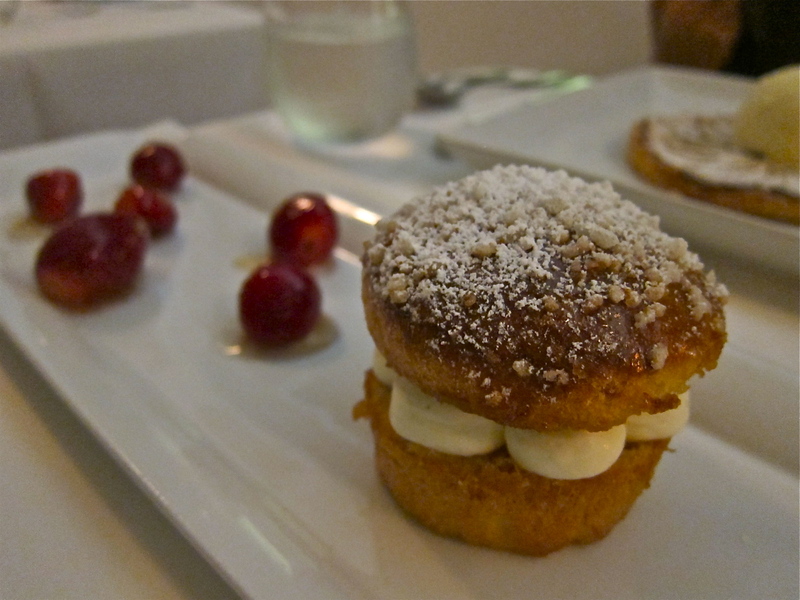 The fluffy brioche had a sugar-dusted crust that added an extra sweetness to the dish. The brioche effortlessly collapsed into the delicate mascarpone and the two paired harmoniously together. The strawberries were soft and the lemon glaze brought out the fruit’s sumptuous floral flavor. Fig & Olive has elevated the traditional strawberry shortcake and created something inspired and irresistible. Up next on the menu was a warm caramelized apple tart ($9). The puff pastry of this tart was crispy yet pillowy. The buttery, rich caramelized apples were sprinkled with powdered sugar and topped with a dense vanilla ice cream. As the ice cream slowly melted, a sweet milky coating flooded the folds of puff pastry and thin slivers of apples. I’m a sucker for apple pie a la mode so this dish definitely hit the right note with me. 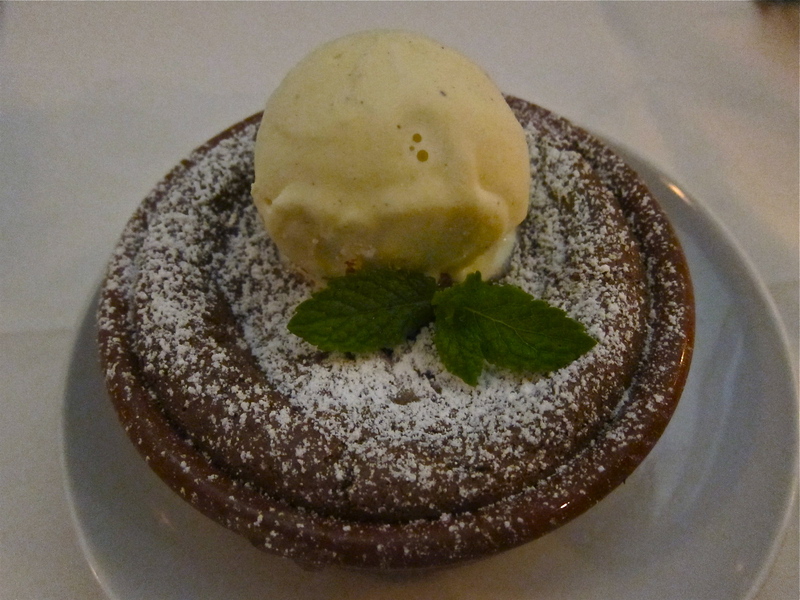 To end the meal we were served a warm chocolate soufflé with vanilla ice cream ($9). I could enjoy only a few bites of the gooey rich cake after such a decadent meal. After all those sweets we hit a sugar wall and called it a night. Post-sugar coma quickly followed, but it was well worth it. If you’re around Melrose and La Cienaga and you’re in need of a sweet fix, Fig & Olive has got you covered! Thanks to Meghan for hosting such a lovely dessert dinner and Lynn for being a great date. Yummy.. marscapone & amarena cherries..oh yes! Janet – those cherries are just heavenly! wow i love the sampler so cute and cool you get to try so many desserts! the dessert crostini looks good! These desserts look so yum! 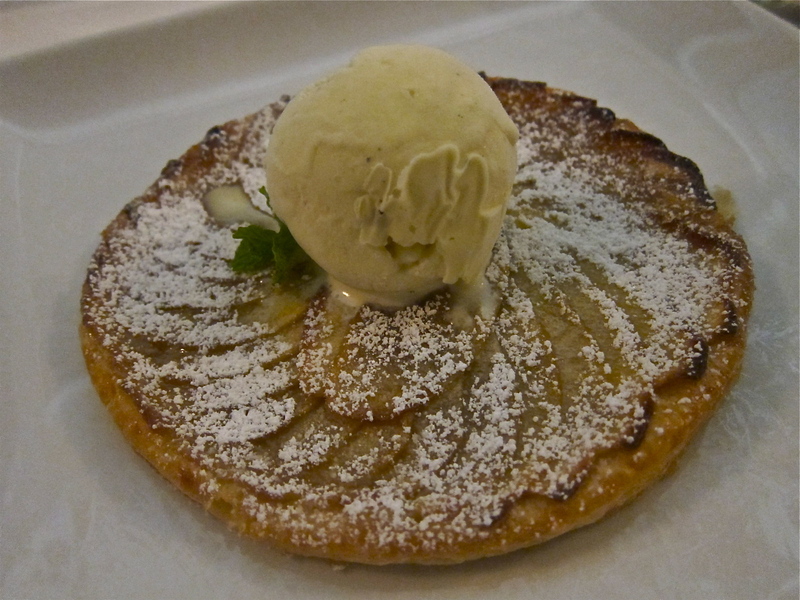 Especially the carmelized apple tart with the giant scoop of vanilla ice cream. 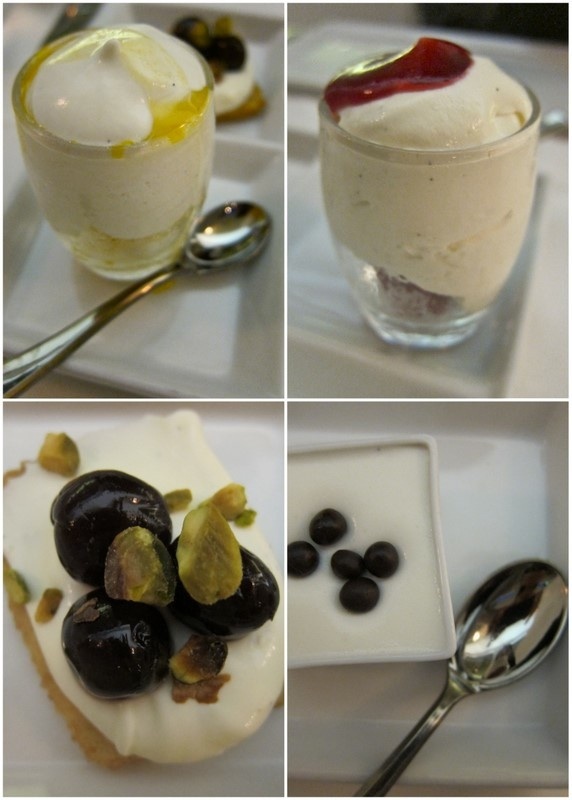 I haven’t been to Fig & Olive yet but I love the idea of desserts for dinner. Dessert for dinner? I would be into that. This looks so good!